Two Buffalo police officers have been cleared of wrongdoing in the shooting death of an unarmed man who was trying to flee the scene following a traffic stop in May of 2017. 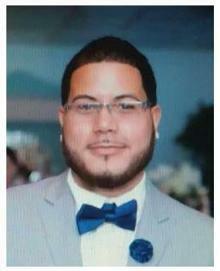 A photo of Jose Hernandez Rossy from his obituary. "The drug dealer here made a very bad choice and the officers went home in one piece," said Thomas Burton, attorney for Officer Justin Tedesco and the Buffalo Police Benevolent Association. WBFO interviewed him after teaching a police academy class of recruits. "It's ironic where you're interviewing me right now," Burton said. "We try to make sure that our officers are conservatively trained about when to use deadly physical force, but on the other hand, we don't want them so apprehensive and so recalcitrant to use force that they end up leaving a shift sideways and not going home to their family." An investigation by the state attorney general's office found no criminal misconduct on the part of officers Justin Tedesco and Joseph Aquino in the death of Jose Hernandez-Rossy. The officers attempted to pull over Hernandez-Rossy in the city's Black Rock neighborhood after they observed him smoking what appeared to be marijuana. Hernandez-Rossy refused to stop, forcing the officers to cut him off. During questioning, Aquino saw Hernandez-Rossy reach for what he believed to be a gun. The suspect then accelerated with the officer halfway inside, eventually striking a house. Aquino heard a loud noise and exited the vehicle bleeding, believing he had been shot. The officers attempted to restrain Hernandez-Rossy, who escaped following a struggle. Tedesco fired three shots, one of which hit Hernandez-Rossy in the arm. He died from a ruptured artery. Investigators later determined he did not have a gun and the officer's injury was due to an airbag deploying. Burton said the legal issue is simple. "What did the officer who fired reasonably perceive?" Burton said, "and I don't know how you can get any tighter perception that his partner was shot when he saw the other officer with his ear hanging off, blood squirting out of the cop's head and at the same time saying, 'I've been shot. Help me.'" In fact, the noise came from the air bag in Hernandez-Rossy's car going off when it hit a house near East and Garfield and the ear injury may have been caused by the air bag. The AG's report found the use of deadly force was justified due to a reasonable belief that the suspect was armed and had shot the officer. Attorney General Eric Schneiderman said Hernandez-Rossy's death was a tragedy, but based on a thorough investigation and analysis, including 13 eyewitness accounts, the officer's actions did not constitute misconduct. “Based on a thorough investigation—an investigation that included accounts from more than a dozen civilian eyewitnesses and a review of photographic and video evidence—and an exhaustive legal analysis, under the chaotic circumstances preceding Mr. Hernandez-Rossy’s death, the officers’ actions did not exceed the legally permissible standard of police conduct established by the United States Supreme Court and New York state law. This determination does not lessen the tragedy of Mr. Hernandez’s death, nor does it excuse the use of excessive force by police in other cases. Nevertheless, we hope that today’s extensive and transparent report about our investigation will provide the community and Buffalo PD with the facts, evidence, and recommendations necessary to help prevent these types of tragic events from happening again,” Schneiderman said, in a statement. Hernandez-Rossy was the father of three young children. Burton said both officers are still off duty. "They're on Injured on Duty status," he said. "Neither officer has come back to duty. Tedesco is still not fit for duty as a result of the injuries he sustained and I suspect we will have a quick Internal Affairs review and this will be resolved very quickly." That is just the criminal case. The family of Hernandez-Rossy is expected to file a civil suit against the city, which would probably require both officers and the witnesses to testify about what happened. This is the second time in two-months that the AG's office cleared officers in a confrontation death. The deaths of Hernandez-Rossy and another unarmed man, Wardel Davis earlier in the year, sparked protests of the department. One recommendation in the report suggests is that the Buffalo Police Department look into equipping officers with Tasers. The report also criticized the BPD's investigation of the Hernandez-Rossy incident. The AG's office urges the department to become an accredited law enforcement agency, saying the investigation was "lacking in areas of evidence collection and documentation, including, in particular, the BPD’s failure to perform – or perceive the need to perform – a prompt and complete accident reconstruction."